North Country Underground Railroad Historical Association. The North Star Underground Railroad Museum is located in the Town of Chesterfield Heritage Center. It had its grand opening on May 21, 2011. (Read about the ribbon-cutting ceremony at the Peru Gazette.) The Museum reveals the hidden history of the Champlain Line of the Underground Railroad. 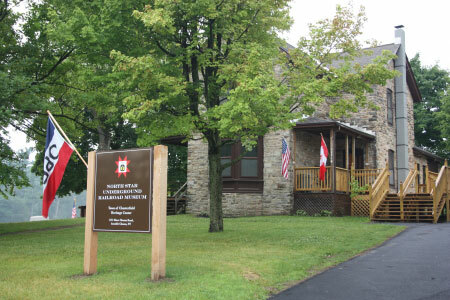 The Museum and the Heritage Center are managed by the North Country Underground Railroad Historical Association. Poignant exhibits portray compelling stories of fugitives from slavery who passed through Northeastern New York and the Champlain Valley on their way to Québec and Ontario, Canada. Among our innovative displays are a multimedia production of the heartrending and triumphant story of John Thomas and his family. Thomas escaped from the cruelties of slavery in Maryland and settled on his own Adirondack mountain farm. A series of informative displays depict the debate over slavery and how it divided many of our churches. A leg iron found hidden in a nearby Quaker home is the centerpiece. A regional exhibit identifies safe-houses and illuminates the lives of men and women who represented every stage of the antislavery struggle—from petitions to war. The Champlain Line of the Underground Railroad encompassed the Upper Hudson River, the Champlain Canal, and Lake Champlain. Runaway slaves who reached these waterways took steamboats, barges and canal boats as part of their northward journey. Stagecoach and railroad lines from New York City and New England provided land routes into the region. Lake Champlain was a Gateway to Freedom. NCUGRHA's office and research collection are located in the Heritage Center. The Museum and the Center are open 7 days a week, from 11 am to 4 pm from the last Saturday in May to Columbus Day (open until 5 pm during July and August). The Museum can be opened for private tours by appointment throughout the year. Admission is free but donations are gratefully accepted. The Museum gift shop offers a selection of items and books about the Underground Railroad. NCUGRHA members receive a 10% discount on gift shop purchases. The NCUGRHA welcomes your visit! The North Star Underground Railroad Museum at Ausable Chasm, New York, is located in the Town of Chesterfield Heritage Center.